The Cessna L-19/O-1 Bird Dog was the first all-metal fixed-wing aircraft ordered for and by the U.S. Army following the separation of the U.S. Army Air Forces from the Army in 1947, when the service became the U.S. Air Force (USAF). In addition to the U.S. Army and USAF, the Bird Dog served with the Unites States Marine Corps (USMC) and 19 foreign countries. 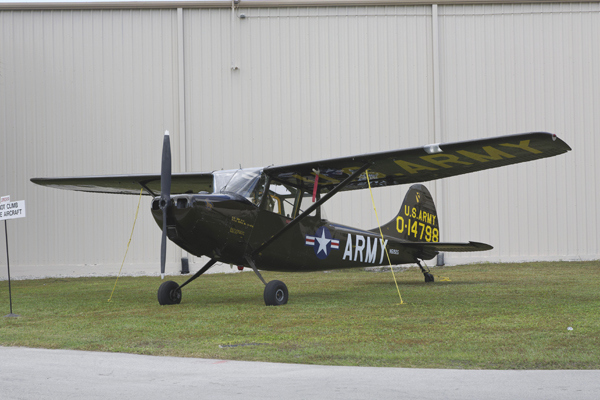 The Birddog was first built in 1950 by the Cessna Aircraft Company as a military reconnaissance plane. Between 1950 and 1964, 3,398 airframes were built. Originally called the L-19, these planes saw extensive duty during the Korean War from 1950–53, often in the hands of veteran World War II fighter and bomber pilots. The Bird Dog was re-designated the 0-1 in 1962 and was flown in Vietnam until that war ended in 1975. The L-19 received the name Bird Dog as a result of a contest held with Cessna employees to name the aircraft. The name was chosen because the role of the army’s new aircraft was to find the enemy and orbit overhead until artillery (or attack aircraft) could be brought to bear. While flying low and close to the battlefield, the pilot would observe the exploding shells and adjust the fire via his radios, in the manner of a bird dog (gun dog) used by game hunters. The Bird Dog met up with the Seahorses midway during the Vietnam War. The 183rd RAC was organized and activated at Fort Hood, Texas, in 1966 and began their combat tour in June of that year in Vietnam’s Cam Rahn Bay. The name “Seahorses” derives from the 183rd‘s use of the image of Pegasus, the winged horse of classical mythology, as its symbol. As the company made nearly daily visual reconnaissance flights above South Vietnam, U.S. combat units began calling the 0-1 Bird Dog spotter planes and their 183rd RAC pilots “the Seahorses.” Replicas of actual sea horses became the company trademark, and silhouettes of the tiny marine animals adorned the wings of all 183rd aircraft. During the course of the Vietnam War, 469 O-1 Bird Dogs were lost to all causes. The USAF lost 178, the USMC lost seven, and 284 were lost from the U.S. Army, South Vietnamese forces and clandestine operators. Three Bird Dogs were lost to enemy surface-to-air missiles (SAMs). Gibson said that his company, which is holding its annual reunion in Colorado Springs this September, is proud that the Bird Dog is being honored with a permanent place at Lyon Air Museum. “The Viet Cong found it hard to get a decent offensive going with Seahorse spotters tracking their every move,” he said. Following the war, the USAF phased out the O-1 in favor of the O-2, and many O-1s in the United States were sold as surplus. Many O-1s were turned over to the Civil Air Patrol for such duties as aerial search. The L-19/O-1 is a popular ex-military “warbird” with private pilots. As of June, 2009, more than 330 were registered with the Federal Aviation Administration (FAA). Others are owned and operated outside the U.S. by individuals and flying organizations. We need to find a record of a birddog going down on December 25, 1966. Where can we locate records of these plans. This plane was flown by Ernesto Serna. Carol, did you ever find information about the midair between the Huey and the Birddog that went down on 12/25/66. I still have not heard anything. THought maybe you have?…. Google something like US Army fixed wing accidents. I know it’s out there because I’ve seen it. Keep trying.